After a nonprofit’s plan to convert a former Manchester church into an overflow cold weather homeless shelter failed to materialize, a local developer already familiar with the area is making a move to secure the property. ‘We simply could not accomplish the necessary steps to purchase the property within the time constraints of the existing agreement,” said Jay Brown, CCC’s division director of housing services, in a statement. 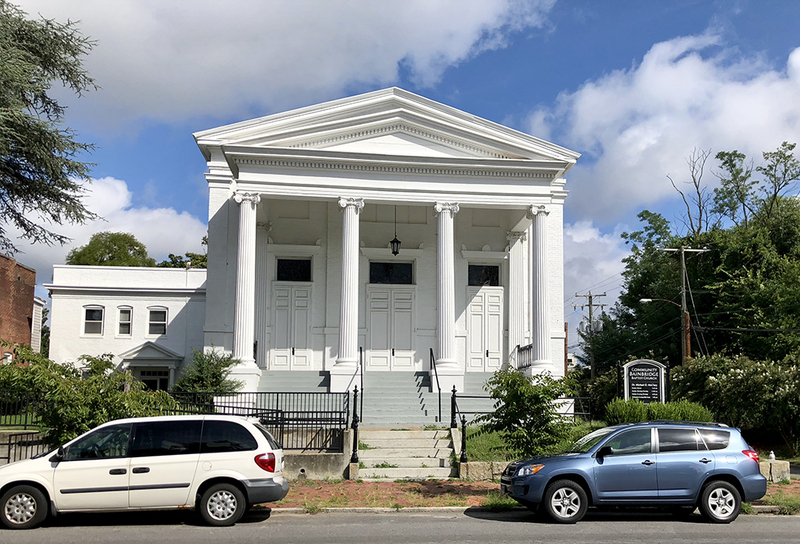 The transaction would include the 17,000-square-foot church building that once was used as the congregation’s offices, kitchen and sanctuary; the neighboring two-story parsonage at 1109 Bainbridge St.; and a 0.2-acre lot behind the main church building at 1100 Porter St. that houses a basketball court. The three properties most recently were assessed by the city for $742,000. Joyner Commercial had the combined properties listed for about $1.4 million, according to its website. Adamson said he made an offer on the site in April, but fell short of securing it after CCC placed it under contract. Adamson would not disclose when he expects to close on the property, or any plans for the site. The former church properties are zoned R-63 residential, which calls for multifamily urban development. “It was of interest to me to make a move on the property since I own the properties next door,” Adamson said. The new agreement ends a contentious couple of weeks for residents and property owners in Manchester — many clearly torn about whether the shelter was a right fit for the neighborhood. During a packed Aug. 9 neighborhood meeting at Legend Brewing Co., several residents against the shelter spoke about the neighborhood’s lagging public infrastructure, lack of efficient access to employment centers and medical facilities, and lack of a full-scale grocery store. Others welcomed the idea of having such a facility in the neighborhood, which is one of the city’s most economically diverse. CCC currently operates the cold weather shelter at the city-owned Public Safety Building downtown on 105 N. Ninth St., where Brown said the facility’s deteriorating condition has prompted the nonprofit to go about securing a larger and more suitable home. After casting a wide net for properties across the city, the agency chose the Bainbridge location because its size could accommodate up to 200 people — hoping to transform the site by Oct. 1 into a shelter, which would have required the special use permit from the city. The charity placed the property under contract, and was in its due diligence phase to determine if the location was suitable for the shelter it administers for the City of Richmond. As part of the SUP process, Brown said the agency wanted to operate the cold weather shelter Oct. 1 through April 15. And unlike the Public Safety Building facility downtown, the Manchester shelter would have been open 24 hours during those cold months – a measure Brown said would have prevented its users from being out in the elements during the rest of the day. Brown said CCC is considering other locations to house the shelter but would not discuss them. He said it would continue to operate out of the Public Safety Building as long as the city allowed. He added that CCC’s existing operations — its headquarters at 1601 Rolling Hills Drive in the West End, and its facility at 511 W. Grace St. downtown — would not be affected by the terminated contract. Andy Condlin, an attorney with Roth Jackson, said the law firm will be working with CCC in locating and acquiring another location, along with any necessary rezoning or special use permit applications the charity would need. Long bullish on Manchester since investing in the neighborhood back in 2007, Adamson’s Corinthian Construction firm has developed several mixed-use, multifamily properties in the area. Work is slated to begin on his latest extension of Manchester Park, where Adamson and Macfarlane Partners’ Charles Macfarlane plan to break ground this month on the 1200 block of McDonough St. on a new mixed-use building with 33 apartments and a 4,000-square-foot corner commercial space. The duo also completed six townhome-style duplexes and a 12-unit apartment building with a corner commercial space along McDonough Street between West 13th and 14th streets about a year ago.